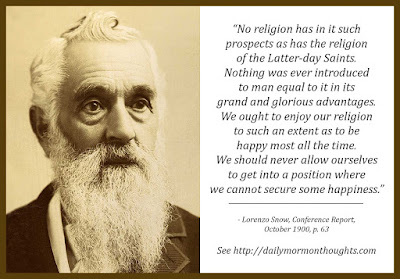 Lorenzo Snow (1814-1901) was an early convert to the Church along with his sister Eliza R. Snow. He was called as an apostle by Brigham Young in 1849. He served as the 5th president of the Church from 1898 until his death in 1901. "God bless you, by brethren and sisters, and let us try and be as perfect as we possibly can from day to day. 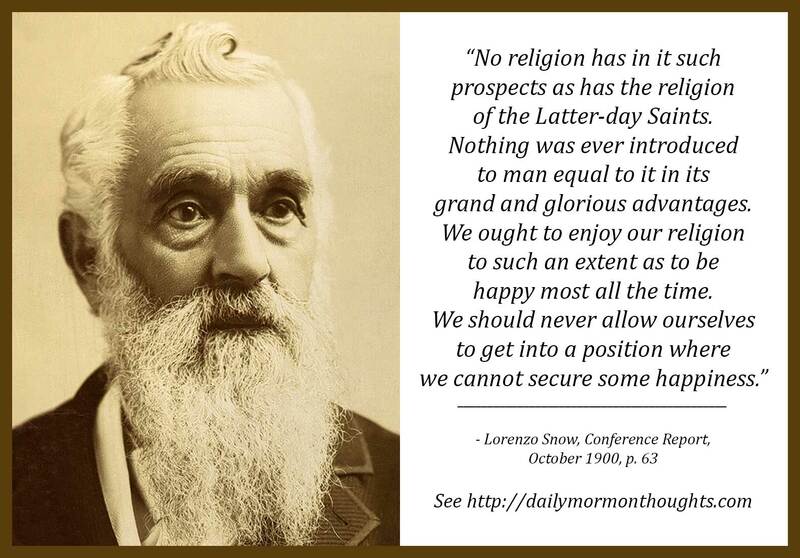 No religion has in it such prospects as has the religion of the Latter-day Saints. Nothing was ever introduced to man equal to it in its grand and glorious advantages. We ought to enjoy our religion to such an extent as to be happy most all the time. We should never allow ourselves to get into a position where we cannot secure some happiness. "The prospects that have been opened up to us are grand. In the next life we will have our bodies glorified and free from sickness and death. Nothing is so beautiful as a person in a resurrected and glorified condition. There is nothing more lovely than to be in this condition.... So long as we are faithful, nothing can prevent us from getting all the enjoyment that can be secured through prospects of this kind. Whether we are in prison, or whether we are in poverty, these prospects are always before us, if we live our religion. Now, brethren and sisters, be faithful, keep the commandments of God, and do not forget the teachings that you have had during the three days of this conference." Part of the key to happiness is understanding the eternal scope of our lives. Knowing what the future holds makes it easier to confront present difficulties. President Snow reminds us of the nature of resurrected, glorified beings; "nothing is so beautiful as a person" in such a state. We need only be faithful in life in order to secure those eternal prospects, and feel the strength they bring to us now.